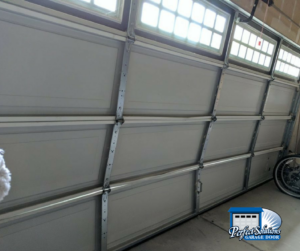 Our latest project involved fixing this damaged garage door. 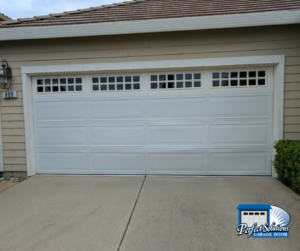 Our customer was leaving her house in a hurry, and backed out of her garage while the door was still closed. Uh oh! Backing into a closed garage door of course resulted in some damage. You can see what we found when we arrived on the outside and inside of the garage door below. The main repair that needed to happen was replacing the damaged panel. 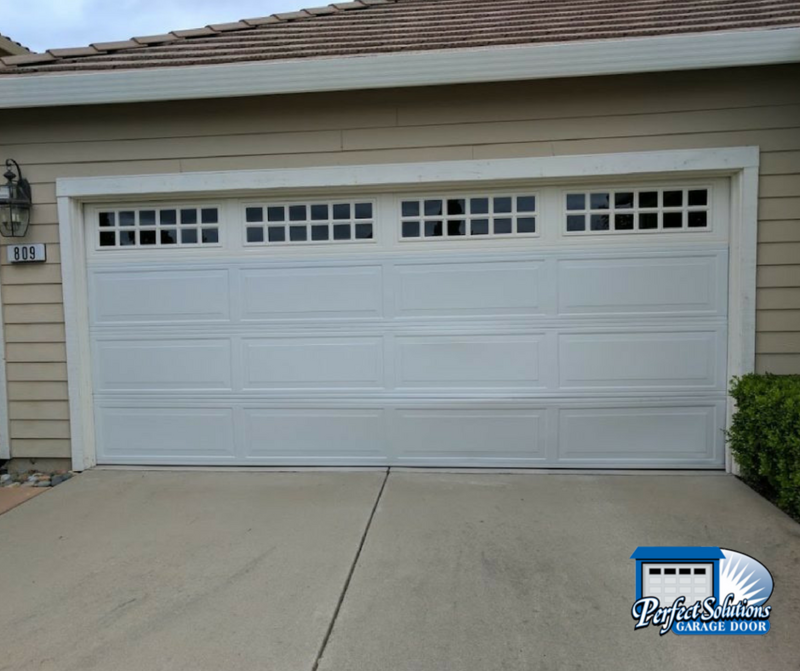 However, our customer decided to go ahead and get a brand new garage door instead of just replacing the panel. She wanted a more durable, and thicker, door. Once we installed her new door, we all installed braces to reinforce it as well. The new more durable door plus the braces should help lessen the impact of a future garage door accident. Above you can see the braces we installed to reinforce the door. If an impact occurs again in the future, the new door plus the braces should minimize the damage. This of course depends on the force of the impact. We also added insulation to our customer’s door. Her garage door faces west, so it was getting a lot of sun. Especially in summer, the garage was VERY hot. 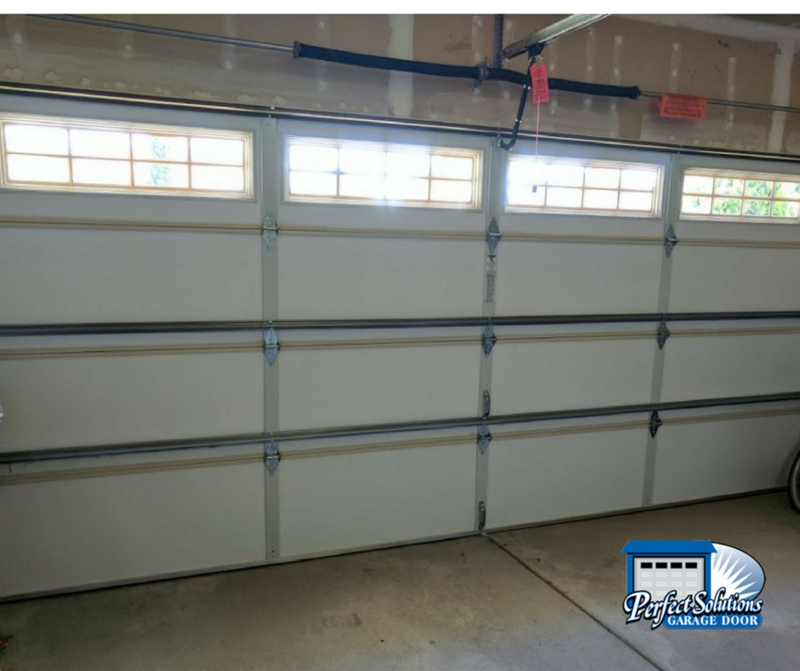 The insulation helps to regulate the temperature in the garage. It also acts as it’s own reinforcement of the door. 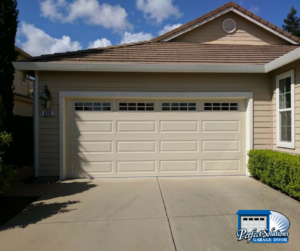 The last piece of this project was painting the garage door. We matched the paint of her trim to match the garage door. Even without the new garage door, painting your garage door to match the rest of your home’s color scheme is a great and inexpensive way to improve the curb appeal of your home! Now the door looks great! It also opens more quietly and much more smoothly than it did before thanks to the new door, and insulation. 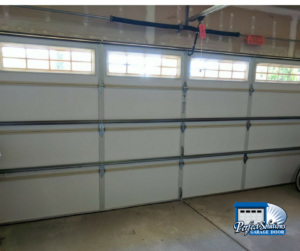 This entry was posted in Blog, Garage Door Repair, Project. Bookmark the permalink.